New York: The Publishers Printing Co, 1908. 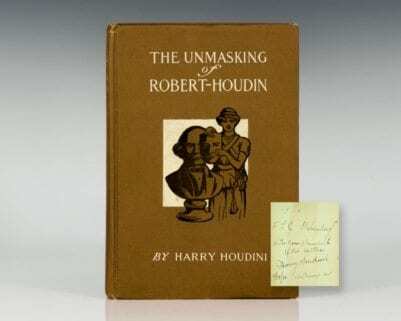 First edition of this work by Houdini regarding his one-time idol. Octavo, original cloth, frontispiece of Houdini, illustrated throughout. 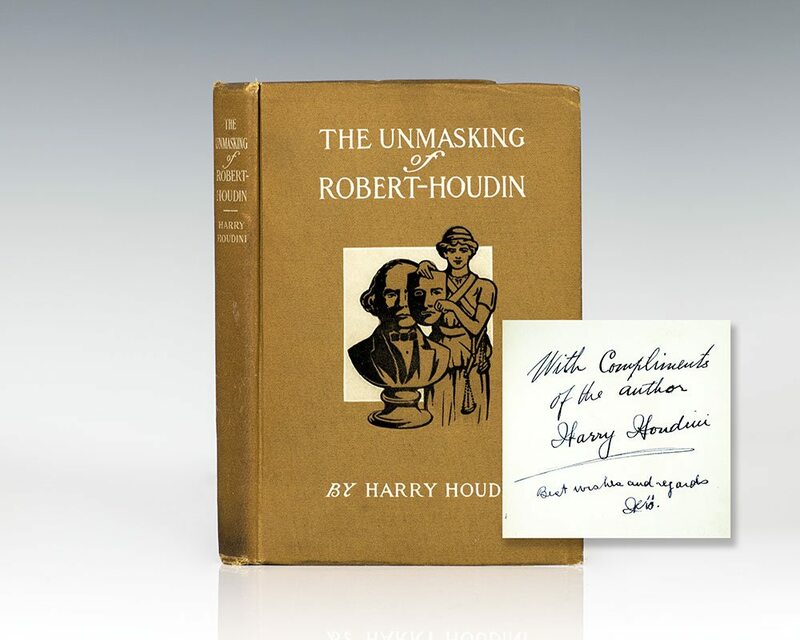 Signed by the author on the front free endpaper, “With Compliments of the author Harry Houdini Best wishes and regards HH.” Bookplate, in near fine condition. “Harry Houdini was a unique figure in the history of entertainment… a hero of legend and folklore.” Following the death of his mother in 1913, Houdini began to investigate spiritualism and “soon became an all-out crusader against it. Early in 1924 he began lecturing throughout the United States on fraudulent mediums. In city after city he attended séances in disguise, exposing frauds on the spot and sometimes securing their arrest, aided by his personal squad of detectives. The raids brought him huge publicity as well as a million dollars in lawsuits.” At his death in 1927, “he was buried in a brass replica of the iron casket, his head pillowed on a bundle of his mother’s letters to him” (ANB). The legendary magician and illusionist Harry Houdini turns a critical eye to the astonishing claims of those in his own profession in his work Miracle Mongers and Their Methods. Using personal research and observations, Houdini reveals the cunning techniques employed by fire-eaters, sword swallowers, and other masters of deception to mystify and amaze audiences around the world. First edition of this work by Houdini regarding his one-time idol. Octavo, original cloth, frontispiece of Houdini, illustrated throughout. Inscribed by the author on the front free endpaper, “To F.L.C. Wehrenberg Jr. with compliments of the author. Harry Houdini 4/27/16 Baltimore MD.” In near fine condition with some light rubbing and wear.